Crop circles are areas of cereal or similar crops that have been systematically flattened to form various geometric patterns. They have been found in fields of wheat, barley, canola, rye, corn, linseed and soy, including rare finds located over treetops, and in ice and snow. Since 1990 these circles have become much more complex in geometries but the term 'circle' has stuck. They are a worldwide phenomena, with a majority having occurred in England. Various theories have been offered in explaining these formations, ranging from naturalistic to the paranormal. From a naturalistic standpoint, it is believed that the formations are man-made hoaxes or geological irregularities. Paranormal researchers believe the formations are created by UFOs. A study conducted in the UK concluded that 80% of the UK circles were definitely man-made. Most of those circles are the creation of Doug Bower, Dave Chorley, and John Lundberg of which Bower and Chorley were awarded an Ig Nobel Prize in 1992 for their crop circle hoaxing. In paranormal circles it is believed that these 'crop circles' are created by meteorological phenomen and are representative of messages from extraterrestrials to help us with peace on Earth. Published material from the BLT Institute found that the anomalies found in crop circles in England and the US are consistent with having been created when localized columns of vortices/vortexes form over standing crops. Other theories claim that they are atmospheric phenomena such as freak tornadoes or ball lightning. 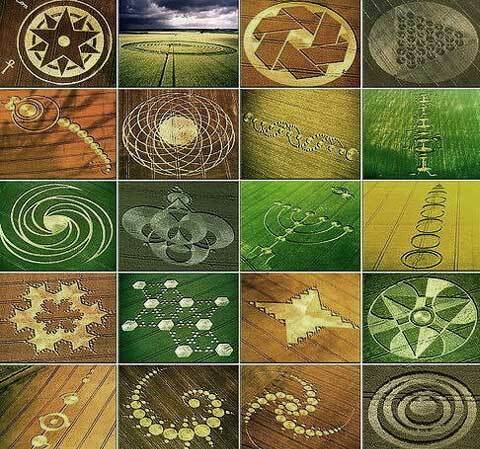 Paranormal researchers call crops circles Cerealogy which refers to the designs as agriglyphs or landscape art. Some enthusiasts suggest that crop circles may be a result of cymatics, the visualization of vibration or sound. According to this hypothesis, the complex patterns are two-dimensional geometric or visual representations of sound frequencies, with higher sound frequencies producing more complex shapes similar to both mandalas and crop circle designs. Some believe that these circles are formed in relation to ley lines and give off energy that can be detected through dowsing. This belief is due to the crop circle locations being at ancient sites such as Stonehenge, Barrows, and Chalk Horses. Another hypothesis is that a man-made satellite in Earths orbit is using some kind of beam (e.g., microwaves) to create the designs. Heating stems of wheat with a short intense burst of microwave energy can produce wilting similar to that in a crop circle. Microwave heating has been shown to be capable of producing these effects. It is also believed that the US government as well as other nations are using technologies similar to HAARP to create these intricate shapes using electromagnetics. Strange happenings have been reported in and around crop circles with the use of electrical devices. Film based cameras frequently malfunction, and even when in proper working order, the results may be overexposed, streaked, smeared, or entirely black. Video equipment is also very vulnerable, and often picks up severe interference. Battery draining is quite common, and even fresh power packs can die. Cell phones often fail to operate within a formation but sometimes work perfectly again if taken outside the formation. Magnetic compasses have been known to behave erratically both inside crop formations and when flying directly over them. Witnesses sometimes report TV, cell phone, smoke alarm and security device interference or malfunctions during nights when a crop circle forms nearby. The night before the appearance of England's, 1991 Barbury Castle tetrahedron (pictured above), residents in the nearby village of Wroughton experienced a power blackout, reporting usual aerobatic display of small, brightly colored flying objects, followed by what many described as a low rumbling noise. 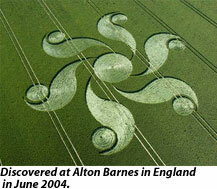 Similar noises had been reported at Alton Barnes crop circle the previous year. Aside from the mysterious occurrences and ideas surrounding the origin of crop circles, many feel that the circles still have merit as a social phenomenon regardless of their legitimacy. This has led to an expressed interest in researching the shapes and symbols depicted. Even though the most complicated crop circles created were documented as human efforts, some crop circle enthusiasts argue that some of the designs have such a degree of complexity that humans would not be able to easily recreate them on paper let alone in a field at night.